Panther goaltender Roberto Luongo is tended to after being injured in the first period. He did not return after coming out of the game. The Carolina Hurricanes took advantage of solid goaltending on their end and an unexpected change in the other net. Jiri Tlusty scored twice and Anton Khudobin stopped 35 shots to lead the Hurricanes to a 3-0 victory over the Florida Panthers on Thursday night. Khudobin recorded his first shutout this season with the Hurricanes, and the third of his career. His last shutout was March 31, 2013, at Buffalo as a member of the Boston Bruins. Jeff Skinner also scored for the Hurricanes. "It’s always good when you (don’t) get scored on in a game. But the most important is we just got the W," Khudobin said. Dan Ellis, who played last season for Carolina, started the second period in relief of Roberto Luongo and made 18 saves. 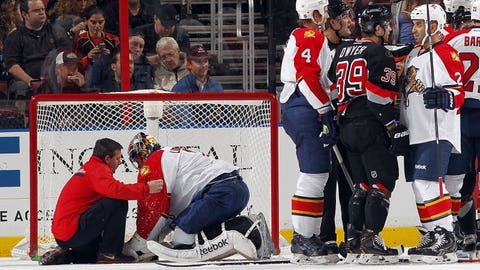 Luongo left the game after the first period with an upper body injury sustained in a collision with Carolina’s Radek Dvorak. The Panthers described it as a precautionary measure. Luongo stopped 11 of 12 shots. Dvorak was assessed a game misconduct at 12:48 of the first when he crashed into Luongo and sent him into the net, knocking it off its moorings. Florida’s Erik Gudbranson was assessed a roughing penalty for engaging Dvorak in retaliation. "I?made the shot and then I was driving like 100 miles per hour to the net and then I got a little push," Dvorak said. "Next thing I?knew I was in the net with Louie, but it was not intentional at all. That’s not my style." Dvorak, who has a home in the area, had over 20 family members and friends attending the game, only to see him exit early. "Obviously, you want to finish the game because you want to play in front of your family, in front of your friends, but sometimes you have a little bit of bad luck," Dvorak said. "But the thing is we got two points after the game, which is more important for us." Khudobin was pleased with his own play but concerned about Luongo. "I?hope he’s OK and he’s not going to have anything, but at the same time it’s just hockey," Khudobin said. "Sometimes it happens, but I?don’t feel good about it." It didn’t take long for the Hurricanes to take advantage of the goalie change as they scored two goals in five minutes. Tlusty scored his second goal after he grabbed a loose puck to the left of the net. Ellis fell down in the crease and wasn’t able to reach across to block the shot from the left side. Tlusty found the net at 2:30 of the second for his third two-goal game of the season and a 2-0 lead. The Hurricanes stretched their advantage to 3-0 on Skinner’s goal. He took a pass from behind the net and his shot from the right side beat Ellis on the stick side at 5:46 of the second. "It’s never a fun situation because you know your partner . something might not be good with him," Ellis said. "That’s the job and you have to be ready when they call you. I wish I could have made two more saves." The Hurricanes took a 1-0 lead on Tlusty’s first goal 9:09 into the first period. Eric Staal grabbed a loose puck along the left boards and brought it toward the net. He passed to Tlusty low in the right circle. Tlusty was able to work the puck and get Luongo out of position and score on a wrist shot. "Tonight we scored the first goal, which is always better than being one down. Everyone came ready," Tlusty said. NOTES: Gudbranson returned to the lineup after missing the past nine games with a knee injury. … The Hurricanes won all three games against the Panthers this season. … Khudobin has started five of the past six games for the Hurricanes.